Hi all! 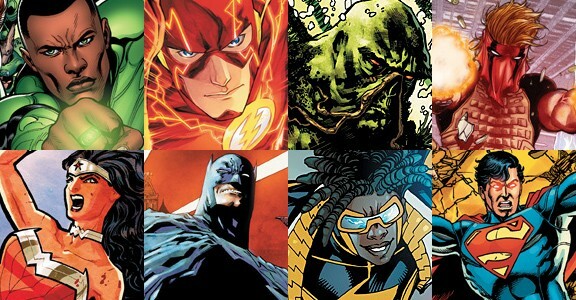 You’ll be glad to hear that I thought it was about time I came good of my promise and offered up a few reviews of the better offerings from the New 52 Universe. I’ve been harping on about the reboot that the DC Universe undertook but, until now, I haven’t really given you, the readers, any true incentive to invest as much time (and money) in the Universe as I have. So, what better way to peak your interest than to offer you a review and insight into some of the better offerings of the DC Universe. The reboot took place in September 2011 and, given that it’s nearly four years on, I think I can now offer up an insight and opinion of those, I feel, are the pick of the litter. Now do bear in mind that I am not a wealthy woman and therefore I don’t own every issue or volume in the New 52 Universe. However, through trial and error (such as the huge error I have deemed the desecration of Lobo), I feel that I have hit upon a few winners that will prove a valuable addition to any DC fan’s comic book collection. Also, for those that are new into the DC Universe or even comic books themselves, some of these suggestions may prove a good building block to start your collections. For my first bout of reviews, I’m going to start with titles that appeared in the first wave. Now I do like to keep an element of surprise, however, I will say that all the titles I have chosen from this wave, still carry on to this day, though, that can’t be said for all of them (sob). So yes, please keep an eye out for these over the next while and, as always, any comments or opinions are welcome (even if we agree to disagree). Until then, I’m going to make like Wonder Woman’s jet and disappear!